I fully speak and understand English! 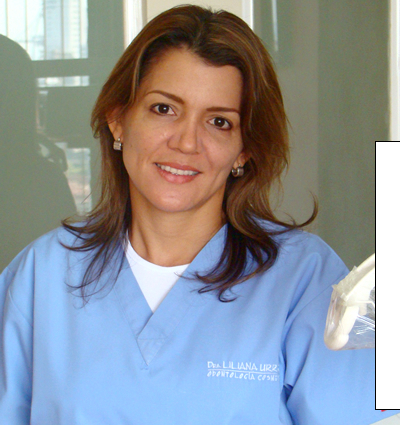 Born, raised, and educated in Cartagena, Dr. Liliana Urrego is proud to call such a beautiful city her lifelong home. She is a graduate of the University of Cartagena, where she earned her Doctor of Dental Surgery, and completed her dental residency at Cartagena Naval Hospital (Hospital Naval de Cartagena). She has been in practice since 1997, and developed her fluency in English while studying abroad in the United States. Dr. Urrego is dedicated to utilizing the newest innovations in cosmetic dentistry, as well as the latest technology. Her office is furnished with state of the art equipment, and conveniently located in the heart of downtown, just steps from the Clock Gate (la Puerta del Reloj) entrance to the Old City, in the Banco Popular tower. With enough advance notice, almost all appointments and services can be scheduled and tailored to meet the needs of your schedule during your stay in lovely Cartagena! Dr. Urrego accepts all major credit cards, including American Express, Visa, MasterCard, and Diners Club International. Email me and I will send you a prompt response regarding your dental questions or comments. Copyright: Dra. Liliana Urrego Diseño y Promoción por: W.R., Inc.